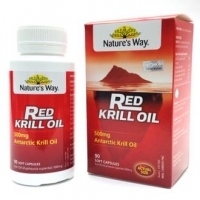 Nature's Way Red Krill Oil 500mg contains an extract of Antarctic Krill Euphasia Superba, sourced form water of Antarctica. Antarctic Krill Euphasia Superba is comprised of three major components: Omega-3 including EPA and DHA, Phospholipids, and a natural source of the antioxidant Astaxanthin, a red carotenoid, which gives krill oil its red colour. Krill oil contains Omega-3 fatty acids that are carried by phospholipids, components that are similar to the structural basis of our cell membranes which makes them readily available and absorbed to help support general health. Indication:ξUsed as a health supplement. Adults> take 1 capsule daily with food or as directed by your pharmacist or doctor. Derived from seafood. Origin of Capsule - bovine.